Plenty of updates this week! Some exciting changes coming to Dead by Daylight.. but first let's start with the livestream updates from Episode #64..
No changes from last week so we still didn't have any updates about the release dates for the DLCs at the point of the livestream.. However, later on in the week.. we did get confirmed dates! 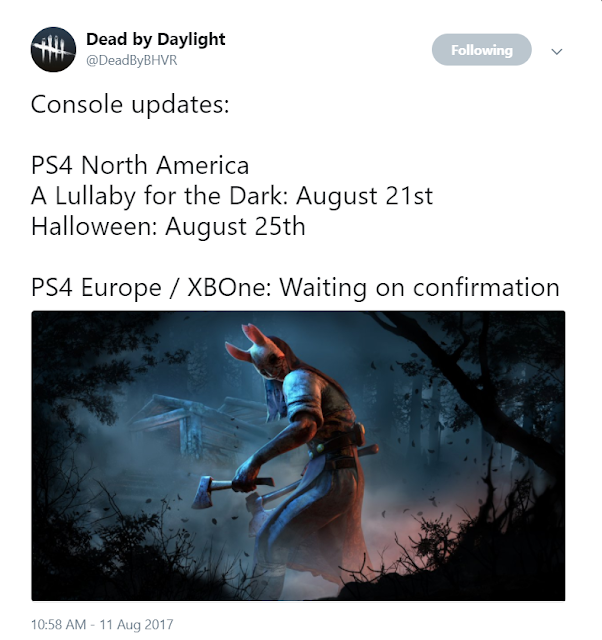 For North America, the free DLC, Lullaby for the Dark will be released on August 21 and..
the paid Halloween DLC will be out on August 25. Yet to get a confirmation for Europe however.. They also mentioned re-work for Daily Rituals and Iridescent Shards is on going to make it more rewarding. 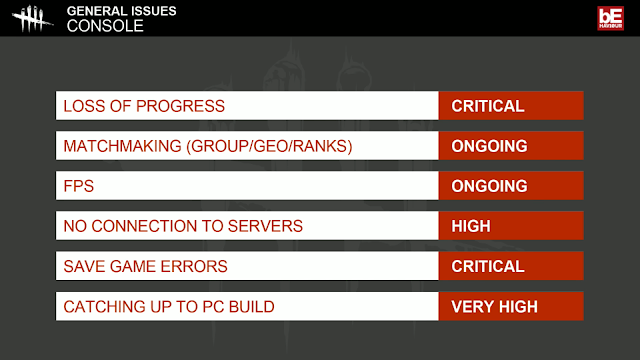 The top issues on Consoles have also been highlighted and are being worked on.. These are all being worked on and will be fixed as soon as they can..
Charity Case! 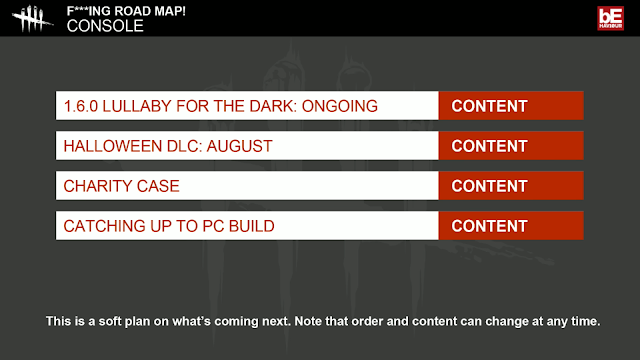 This went live for PC during the Live Stream but as expected, this isn't ready for Consoles yet.. As mentioned in the Road Map above, this should be coming after Aug 25 when both DLCs are out..
26 Customization Items with all proceeds going to Charity. Let's wait for details on Console.. The Doctor will also be getting a re-work and there's plenty of changes being made to improve the Doctor. Here's a fantastic article detailing the new Doctor, by DVS Gaming.. This is also another one of those updates that are part of the "Catching up to PC" build, shown in the Road Map. Yes, it is definitely frustrating of us Console players to see updates coming to PC but we have to wait for it without any confirmed dates but let's be patient.. I can definitely see the Dev Team doing their best to get everything to Consoles asap but there's differences in the way updates can be done on PC & Consoles. And why not? Let the PC build be a testing ground for bugs before the content comes to us! So yeap.. Plenty of cool and exciting updates coming to Consoles in the coming weeks & months! Enjoy!